This entry was posted in bird love, bird song, birding, birds, breeding birds, photography, Sparrows, spring migration, Warblers and tagged Brown Thrasher, Canada Geese, Chicago Ornithological Society, Iosco County, Jack Pine Forest, Kirtland's Warbler, Memorial Day weekend, Nashville Warbler, Orchard Oriole, Vesper Sparrow by Lisa Rest. Bookmark the permalink. Some fascinating birds there, and some great photos. Thank you! I am always intrigued by the change in the landscape only a few hundred miles away, and what a difference it makes for all living creatures. I hope I find time to take more “local” trips before it’s too late. 🙂 And I’m still trying to figure out what’s growing in my yard. Get well. Look after yourself properly. Busy, busy, busy! You need 28 hour days and 8 day weeks…Do not overwork yourself! The warbler is a tiny jewel of a bird. Nice to know about that place in Michigan. 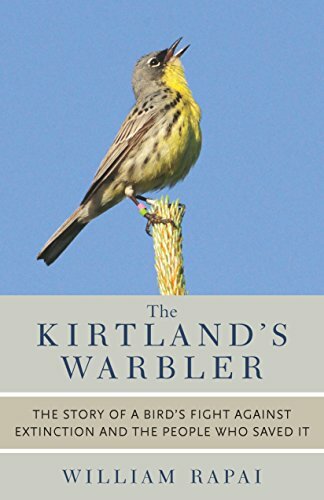 What’s amazing is the Kirkland’s is the largest warbler. The larger conservation project is in Grayling but wherever Jack Pines grow and people are willing to create the habitat and manage it, the Kirkland’s has a chance. I guess a measure of this spot’s success is now they have a cowbird trap, whereas I don’t remember seeing one here 3 years ago.